Should you buy a house in Oakland or Berkeley now? I am talking to people everyday who are on the fence about buying a home now. Is now the right time to buy a house, or should you wait to see what the Oakland and Berkeley real estate market will do. When looking at the graphs above provided by BrokerMetrics. 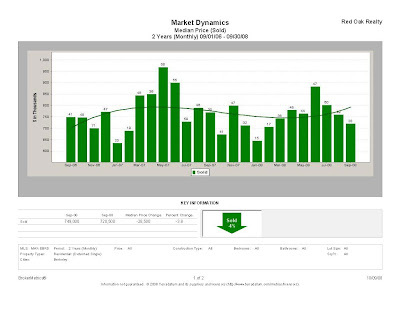 Home prices in Berkeley are down only 3.8% since September 2006. In Oakland the median home price is down a 47.3% since September 2006. These numbers are good to view, but to really understand this real estate market, you need to know exactly what is happening in your zip code and neighborhood. Oakland has seen such a drastic drop in the median price of a house as this statistic includes sales all over the city. When you combine the sales in East Oakland, West Oakland and North Oakland, areas that have experienced a major decline in value, the entire value of the city is affected. Factors that determine value are: crime, the foreclosure rate in the neighborhood and the performance of the area school. 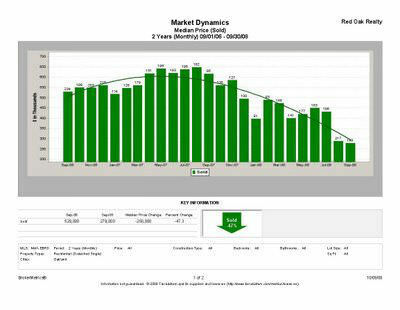 Areas such as Rockridge, Montclair and Crocker Highlands in Oakland have seen drop in price, but overall they are still highly desirable resulting in less of a decline in value. I believe in full disclosure of the pros and cons of the big investment of buying a house. You should know there is a tax credit of up to $7500 for first time homebuyers. This incentive will expire June 2009. For more information, click here. My blog is interactive! Do you have questions? Email me and I will respond. Send me an email at DeidreJoyner@gmail.com or click on the email me button on the side of this page.